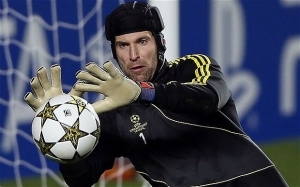 Liverpool FC has revealed its intentions to step-up bid for Chelsea FC’s Goalkeeper, Petr Cech, source said. Petr Cech 32, who is arguably one of the world’s top 10 goalkeepers, could barely get a game this season, because Thibaut Courtois looks like he may well become Chelsea’s best goalkeeper. Cech was Chelsea’s No.1 goalkeeper for 10 years and he is believed to want a move away from Stamford Bridge, after losing his place to Thibaut Courtois, who returned from a highly successful loan spell at Atletico Madrid. As Courtois is just 22, Cech may face a long wait to get back his starting role at Stamford Bridge. With that in mind, the first goalkeeper to end a competitive game unbeaten, at the new Wembley Stadium, could well leave the club this summer. Source reported that Liverpool, Napoli and Roma were all considering bids for the Czech international. Simon Mignolet has impressed between the sticks at Anfield since being dropped earlier this season, but coach Brendan Rodgers would surely love to add a goalkeeper of Cech’s experience and ability to his squad. Liverpool would have to likely rival bids from the two Serie A sides, but Cech is settled in England and Liverpool are likely to offer a bigger deal, considering the new British TV rights deal kicking in next year.